Great for quilters who work with 6.5” blocks. Useful for squaring-up blocks to 6.5” before final assembly. 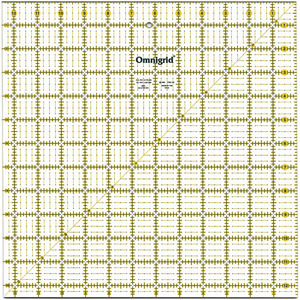 DRITZ-Omnigrid Quilter's Ruler. This ruler was made from a durable premium quality acrylic plastic and laser cut for a smooth edge that allows for easier deeper cutting of fabric layers. The patented double line effect is printed in black and yellow which allows the used to see the grid on both dark and light fabrics. Designed for left and right handed users. Used for sewing; scrapbooking; crafts; weaving and more! Has 30; 45 and 60 degree angle lines marked for easy alignment of fabric. This Ruler Measures 6.5"X6.5" . Made in USA. 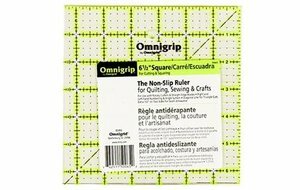 Omnigrid brings easy to see, even easier to cut rulers to you with the Omnigrip ruler. Special non-slip backing eliminates slipping when measuring and rotary cutting. Neon green double-sight lines that seem to glow on fabric make measuring accurately a breeze! 6.5 in sq. with grid.